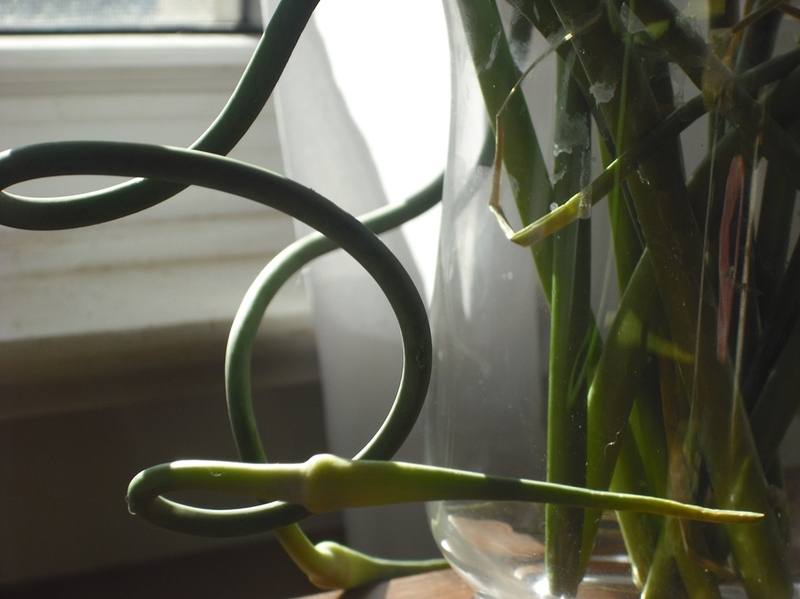 Garlic Scapes, I love you 761 ways…. How pretty are these things? That little beauty to the left of the page is something called a “garlic scape”. I had managed to live 45 years on this planet without ever hearing about scapes. One day a few weeks ago, a facebook friend wrote rhapsodically about it being time for them, so I looked them up. Then I mentioned them to a friend of mine who always seems to know about these things, and she delivered a bag of them to me the very next day. What I’ve discovered is that a scape is merely the stalk of the garlic that has been harvested before it gets stalky and firm. This apparently helps the bulb to develop, and gives us scapes — the less pungent forgotten sibling of what we know of as garlic. What other vegetables haven’t I heard of? I find this mildly concerning — that at my advanced age I discovered something new. I’m a bit humbled by it, but notice that many people have responded to my newly knowing comments about scapes with “…um, what?” Makes me feel better, somewhat. Today I sat for a while, pondering the scapes. I put them in a vase to keep them orderly, and considered just keeping them that way — so pretty and funky and curly. 2/3 cups roasted pine nuts and about 2 cups of roughly chopped garlic scapes (flower bits off). Whiz in food processor, then drizzle about a 1/2 cup of olive oil in, add some salt and pepper. 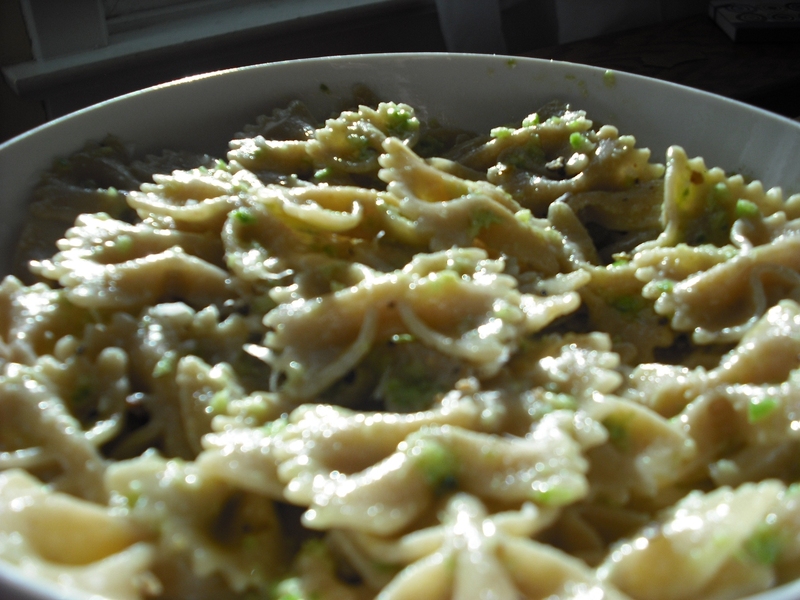 Throw it in a bowl and add about 1 cup of parmesan, put in a generous tbsp of roughly smooshed cumin seed. Air tight container, lasts up to a week refrigerated. 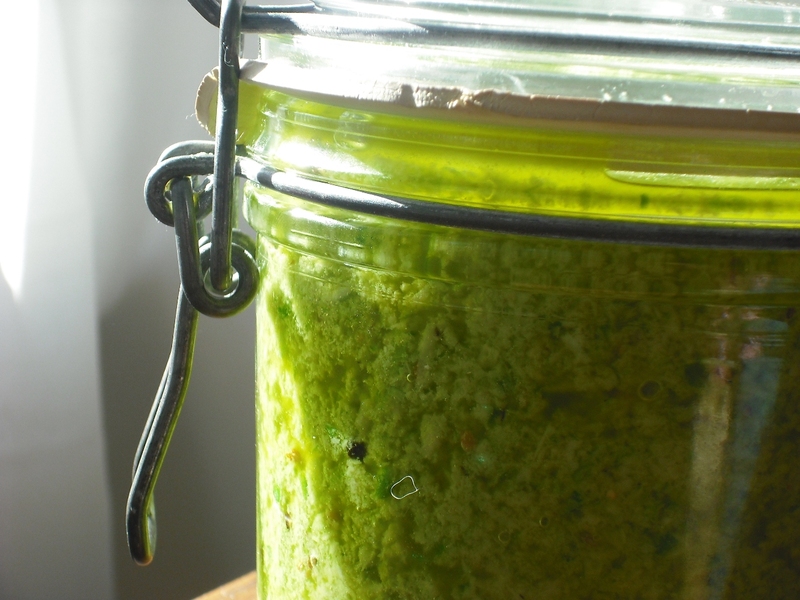 It’s kind of a funny thing, making that pesto. I made about 2 cups of it — that’s a lot of pesto. Usually, I have a few other people in the house with me to share. Right now, though, Mr. Box 761 is in Kandahar working, my youngest daughter is working/staying at the Cadet camp (for 7 weeks!) and my oldest daughter is taking summer courses at university. I’m alone with my pesto. In a week, though, Mr. Box 761 will be here for a month of leave. Certainly there’ll be some left for him to try while he’s home. This is a man who wooed me with (amongst other things) garlic sandwiches… (don’t knock ’em — they were delicious). Recently I’ve been watching a lot of ridiculous television and last night I watched several episodes of a show called “Millionaire Matchmaker”. Quickly, it’s a show about a yenta in Los Angeles who sets up millionaires (usually men) with women who want to date them. The matchmaker is quite a character, and it was her brassy boorishness that drew me to the show — she’s really oddly charming, and so completely invested in her character. Fascinating to watch. These shows seem to go on in marathons, so last night I watched three shows in a row. By the end of it I could have wept — the cavalcade of hard young women, eager “cougars”, lonely narcissistic “millionaires”…. oh, the humanity. I’m so glad I met my husband the old-fashioned way: drunk, in a bar. … I um, wasn’t drunk either — I was “tipsy”.